The pups will be six months old on the 30th and our good buddy, Pete, out in Nevada gave us an update on Spring 2010 litter’s alpha male without us even asking. I will be getting e-mails out to my other owners over the weekend to try and get other pictures and updates, but this is enough to make a dog mama proud! Thanks, Pete! “A little update on Whiskey. Chukar opener was on the 9th and was one of the most disappointing in years. I only harvested 9 birds in three days. Whiskey was outstanding. It rained all week and birds were scattered and if it weren’t for the dog I would have come out of that hunt with no Chukar. 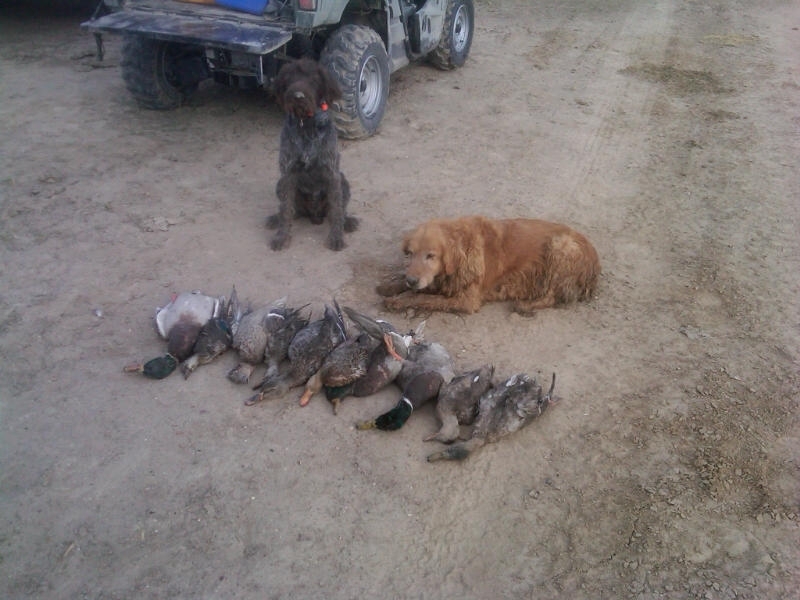 We retrieved every bird that I shot and a half dozen for one of my hunting partners that didn’t have a dog. All birds that Whiskey recovered for my hunting partner where done on scent alone. We got into the Quail on Sunday and Whiskey was hunting with two older very accomplished dogs and my 6 month old pup performed like it was his 5th season. Last weekend was Nevada waterfowl opener and since the Chukar hunting was so bad I decided to give the Ducks a try. I have had Whiskey in the water several times retrieving dummies but he has never even seen a duck before Saturday. After only hunting for a few minutes Saturday morning I dumped a pair of huge mallards at first Whiskey was not crazy about retrieving something that almost outweighed him but after dragging the first pair of ducks back to me by the wing he was hooked on Duck hunting. Sorry for the lack of pictures, like a big dummy I left my camera at home for the chukar opener and only had my blackberry for duck. I promise better pics in the future. Whiskey is doing great on all of his verbal and e collar commands and is picking up hand signals very fast. We are still working on holding point, he is creeping on birds but for 6 months old I am amazed on how well he is doing. On the home front Whiskey is a terrific companion and one of the funniest personalities I have ever seen in a dog. 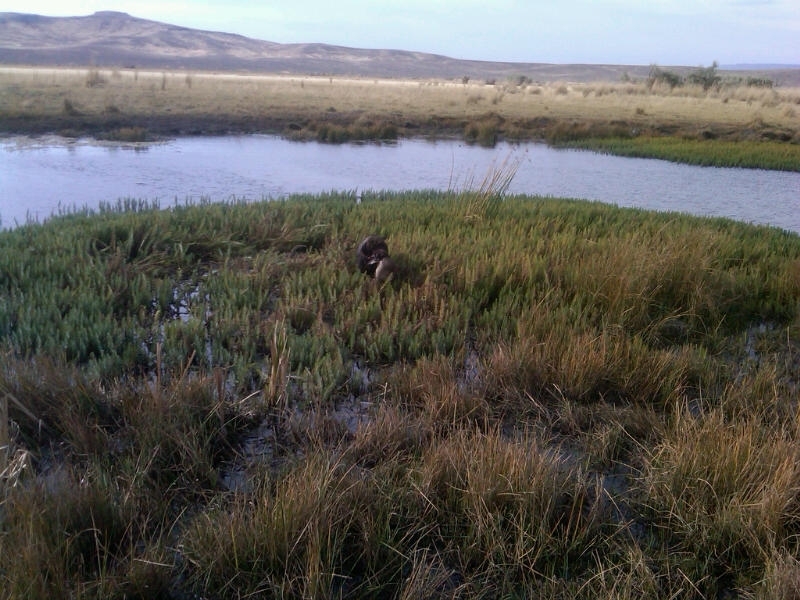 Whiskey’s first duck hunt — he looks like Sam Jr. to me!